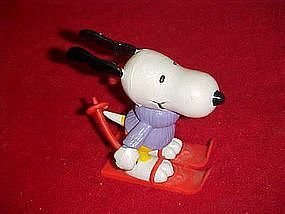 This little pvc figurine of Snoopy is 2 1/2" tall. Snoopy is on a red pair of skiis and his ears are in the wind. Look at him go! Very cute. Made in Hong Kong, dated 1966. Great condition. Check out my catalog for lots of other Snoopy collectibles.